A Chinese Woman Does A Really Bad Job Pretending To Be Hit By A Car : Goats and Soda It's an ancient scam, updated for modern times. Stills from a video of a woman pretending to be hit by a stopped car. They're calling her "China's worst actress." It's not yet Oscar season, but buzz is building about the performance of a Chinese candidate. 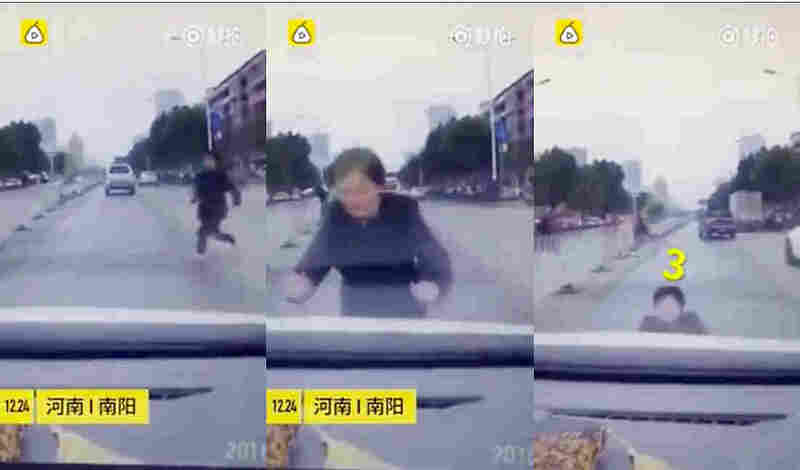 On Dec. 24, a middle-aged woman in the city of Nanyang, in central China's Henan province, was caught on a dashcam as she ran across a road and launched herself onto a car. It's a not-too-uncommon scam in China. Suspects will seek out a car driving at a slow speed and hurl themselves in front of it, only to ask for compensation afterward. The eagle-eyed driver in this case slowed down to a full stop before the fraudster auntie reached the car, leaving her with no apparent choice but to jump forward onto the car and then awkwardly fall backward in an act that one Chinese netizen called "Worst Performance Ever." Not surprisingly, the video has gone viral on Chinese social media sites. The trick has evolved with the times and was popular in China for years, but the advent of dash cameras has helped shame the guilty parties.